VIVO Cannabis Inc. (TSX.V: VIVO) (OTC: VVCIF) is a globally licensed, cost efficient producer of premium quality, organic, standardized medicinal cannabis. One of the earliest licensed medical marijuana producers under Canada’s federally-controlled Access to Cannabis for Medical Purposes Regulations (ACMPR), VIVO has five years of operating experience in the burgeoning medical marijuana space through its flagship operation, ABcann Medicinals, Inc. The company recently received its Health Canada license to produce medical cannabis oils and is working toward production of saleable, extracted, finished products that will lead to a final inspection allowing sales of its oils. “Receipt of the license to produce cannabis oils is a major milestone in our pursuit to provide our medical cannabis patients with additional product formats that can be precisely dosed. The expansion and innovation of our product lines are a top priority for the Company as we continue to serve the needs of our customers, and we anticipate strong demand for our cannabis oil products,” VIVO CEO Barry Fishman said. VIVO owns and operates a fully functioning 14,500 square foot facility in Napanee, Ontario, which is being doubled in size to produce 1,400 kg of cannabis per year. The company’s expansion plans include adding a seasonal greenhouse and a hybrid, multipurpose facility, capable of producing 31,000 kg of cannabis per year between the two facilities, to be constructed on 65 acres it already owns near the Napanee facility. This additional location is properly zoned with existing infrastructure in place for an eventual 1.2 million square feet of production space. VIVO has built a reputation over the years for its best-in-class standardized approach to growing cannabis that includes the absence of pesticides and a computer monitored growing technique that provides a consistent, pharmaceutical-grade with high yields. The company’s custom, scalable growing chambers with proprietary lighting can be replicated anywhere in the world, leading to lower production costs. This technique has helped it record a customer retention rate of 94.7 percent alongside 30 percent month-over-month customer growth. When combined with VIVO’s current yield rate, which it has measured at roughly 100 percent greater than the industry average, the company has constructed a strong foundation upon which to build a sizable presence in the global cannabis industry. This global growth potential is illustrated by VIVO’s partnership with Israel’s Syqe Medical, producer of the world’s first selective-dose pharmaceutical grade medicinal plant inhaler. After visiting VIVO’s production facility, Perry Davidson, founder of Syqe Medical, noted that the company’s production technologies put it “in a class with the best in the world” in its ability to produce standardized pharmaceutical grade cannabis. 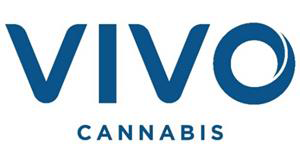 VIVO’s recent acquisition of Harvest Medicine Inc. represents further progress toward the company’s goal of becoming a vertically integrated medical cannabis company. Harvest Medicine is one of the fastest growing medical cannabis clinics in Canada – adding over 1,200 new patients monthly from a single location – with an aggressive expansion plan and a patient-focused approach that perfectly aligns with VIVO’s philosophy of quality and innovation. VIVO’s seasoned management team, board of directors and advisory board features well over a century of combined industry experience. Fishman, who has over 20 years of experience as a business leader, previously served as CEO of both Teva Canada and Taro Canada, as vice president of marketing at Eli Lilly Canada, and as past chair of the Canadian Generic Manufacturers Association. He most recently served as CEO of international specialty pharmaceutical company Merus Labs. Notably, VIVO also has access to the ‘Father of Cannabis Research’, Raphael Mechoulam, PhD, through its board of advisors. An organic chemist and professor of medicinal chemistry at the Hebrew University of Jerusalem, Mechoulam was the first scientist to isolate both cannabidiol (CBD) and tetrahydrocannabinol (THC). He has received more than 25 prestigious academic awards, including the Rothschild Prize in Chemical Sciences and Physical Sciences in 2012.